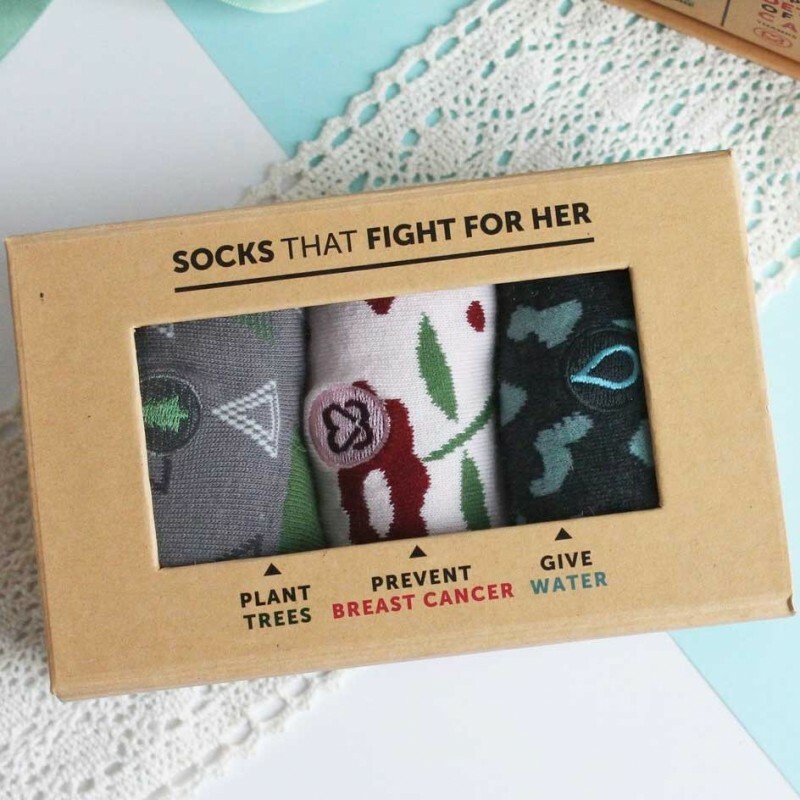 A trio pack of socks that Fight For Her; plant trees, prevent breast cancer and give water. With seamless toes and reinforced heels for comfort and durability, these will quickly become your favourite socks. Made from organic cotton, Fairtrade and GOTS Certified. Sizing in USA standards: Women's 5-9. Set of three. Conscious Step was created to bring awareness to consumers about the problems facing the world, and the organisations trying to combat those problems. The whole supply chain and manufacturing process of these socks is sustainable and ethical. 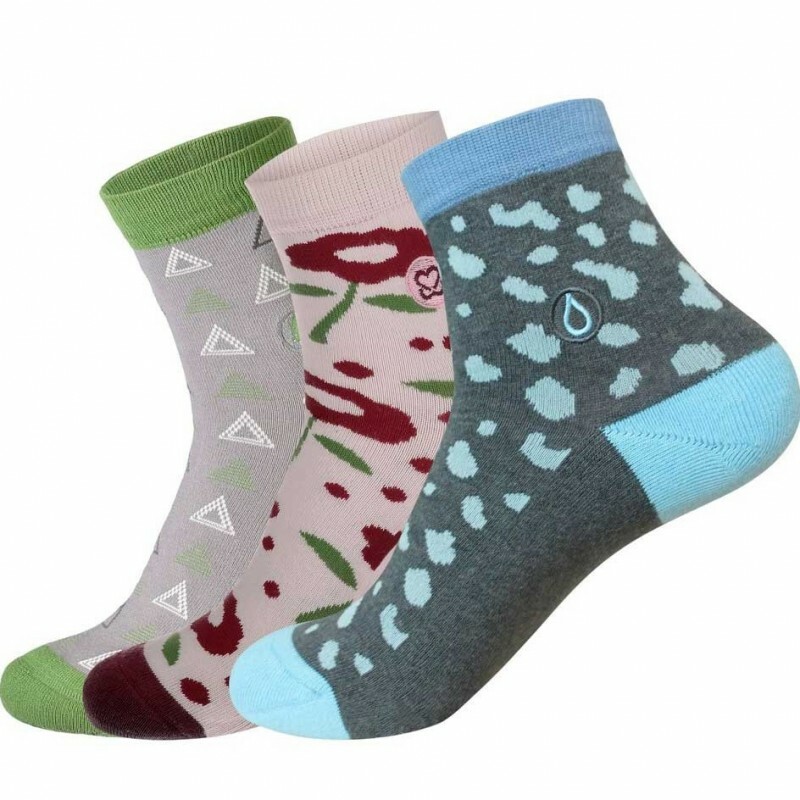 Better yet, a portion of the funds from socks purchased goes directly to a non-profit organisation, creating a tangible impact on our fight to save the planet. Whole supply chain is GOTS (Global Organic Textile Standard) Certified, which ensures the organic standard of textiles. Made with organic cotton, so no chemicals or pesticides are released into the environment. Highly ethical product - sock purchase supports emerging markets and small cotton farmers in India. Fair wages for workers, with overtime compensation and no child labour. 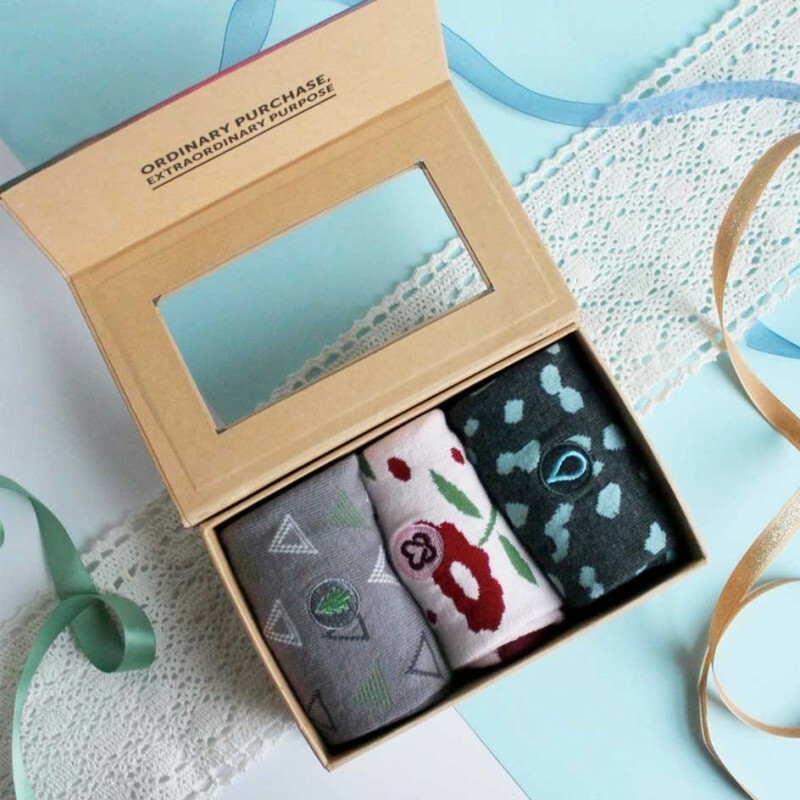 Socks that Plant Trees - all donations from the purchase of these socks supports Trees for the Future: an organisation aimed at planting trees to support families in developing countries. When you plant forest gardens, you create a source of consistent food, income, education and empowerment. With one pair of socks, Conscious Step donates money to plant 20 trees in Uganda. Socks that promote breast cancer prevention - all donations from the purchase of these socks supports Keep A Breast: An organisation dedicated to raising breast cancer awareness. They believe through a monthly self-check routine, more people are likely to detect changes in their bodies quickly, will seek medical advice and potentially detect cancer early. Socks that Give Water - all donations from the purchase of these socks supports Water.org: an organisation that offers small, easily repayable loans so disadvantaged families can install water and sanitation systems in their homes. With one pair of socks, Conscious Step donates enough money to provide safe water for women. 168-needle organic cotton creates great cushioning and ventilation. Seamless toe for greater comfort. Reinforced toes and heels for added durability, making your ethical purchase last longer. Emblem on socks displays a Cause logo. Machine warm wash, lay flat to dry, do not iron. 75% organic cotton, 23% polyamide, 2% spandex. Sizing in USA standards: Women's 5-9. Designed in New York. Made in India. Browse our other Conscious Step socks.